Thursday, Friday and Saturday last week, LinuxTag took place in Berlin. A few months ago, in a moment of temporary insanity, I had proposed to three projects to organize their booths: KDE, openSUSE and ownCloud. As that wasn't challenge enough, I wanted to experiment with doing workshops at the booth, specifically aimed at attracting and training potential new contributors. 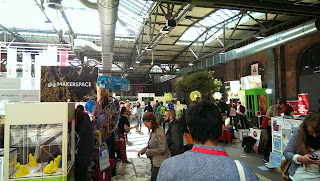 I proceeded to register a booth, promising the LinuxTag exhibition manager (Elke Moritz), the KDE e.V. 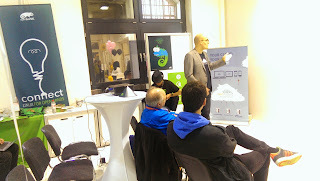 board, the openSUSE Board and my brand new boss at ownCloud that we would set up a great show. As I wouldn't be able to separate ownCloud (PHP) or KDE (C++, QML) code from text in a openSUSE .spec file nor can staff three booths at once, you can imagine I promised more than I could ever deliver on my own. But that's where friends come in, right? And they came through - the result was great. First, a short introduction. LinuxTag is one of the oldest European Linux events, operating under the credo: "bringing .org and .com together". That is, they feature both commercial and community booths and a big selection of talks. LinuxTag has been taking place at the Messe in Berlin in the last years, and this has not been a hugely successful location. But this year, there was change: a co-location with the immensely popular Re:Publica event as well as collaboration with DroidCon was meant to bring a lot of new energy. 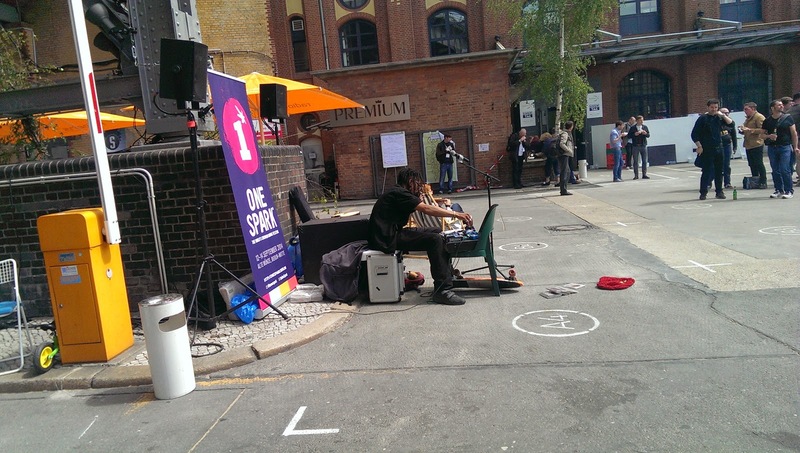 The new location, Station Berlin, gives a more fitting Linux feeling: much more raw. If you ask me, it worked out, LinuxTag was a much better event than it has ever been in the Messe. We wouldn't plan for a big audience: the workshops would go deep and be personal. So, we got together speakers and defined a program (see my blog). I received the ownCloud and openSUSE booth materials home and the day before LinuxTag, drove it all to the venue, picking up KDE stuff from Lydia Pintscher at the wikimedia office later in the evening. Due to some snafu's with the booth area preparations we had to set up the booth in the morning - which happened even before Danimo and myself arrived with some more materials (thanks booth team!). We planned for little space (essentially one combined booth) but the LT team had given us so much space, we had to set up three big booths! 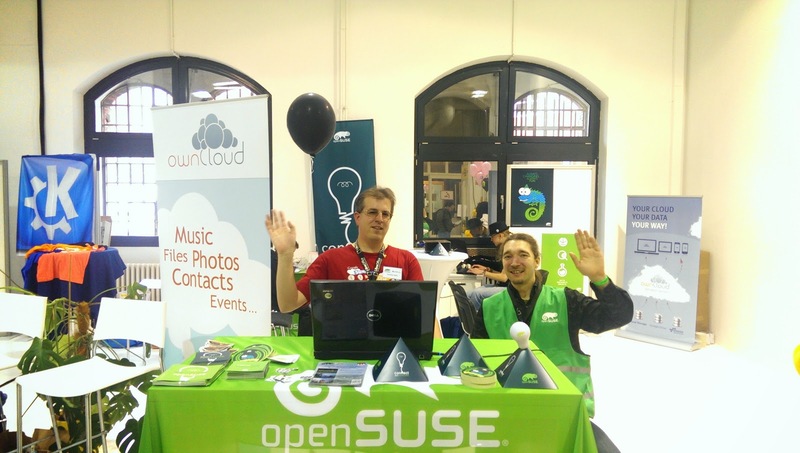 openSUSE got the big table, ownCloud took two round ones and a third round table was covered in the KDE tablecloth, with a huge KDE flag hung up next to it. Behind it all 12 chairs and a table with a projector. All this was quite a bit more than we planned, so the initial idea (we'd only need 1-2 people at a time to do 'booth duty' for the 3-in-1 booth) didn't work out very well: all three booths had to be staffed most of the time. We did have some overlap at quiet times, but full house during especially the breaks. I had printed posters with the schedule, one for each day as we had slight schedule changes every day. 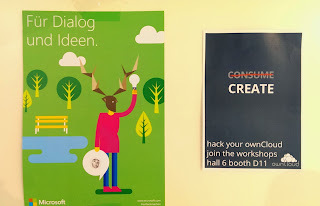 We hung them up all over the place, after which we put down openSUSE, ownCloud and KDE flyers wherever there was space. The openSUSE Beer coasters did particularly well - we had put them on the tables in the eating/drinking area and we had to 'refill' several times a day. Let me now point to this blog by Danimo about the owncloud presence, the KDE blog by Sebastian is out too. And I expect the openSUSE team to publish their blog(s) very soon. 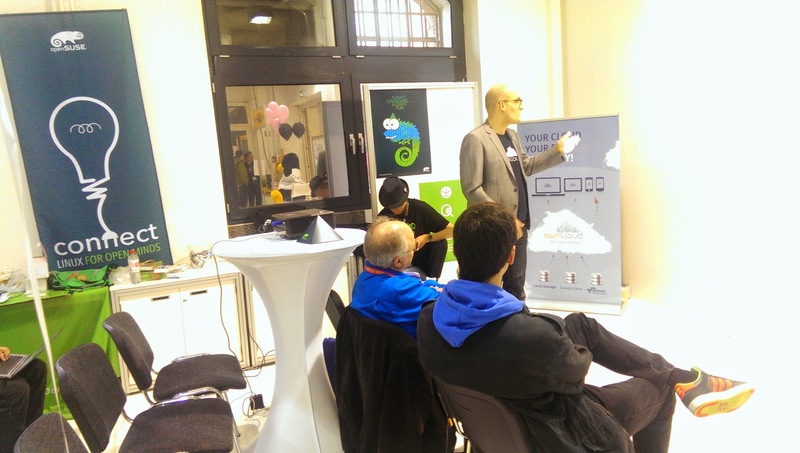 For me, there was some fun synergy: meeting KDE-on-openSUSE users interested in installing ownCloud. Or, after starting a conversation with somebody about one of these projects, continuing the conversation about one of the others. Several times, I got users interested in all three at once: Server Linux (openSUSE/ownCloud) and Desktop Linux (openSUSE/KDE). I also noticed that many visitors already knew ownCloud, or had at least heard of it. 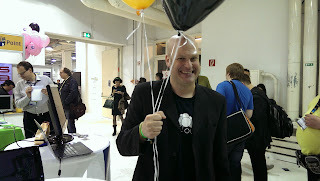 At some point, I was talking to a visitor, explaining ownCloud, while a second visitor joined the conversation. 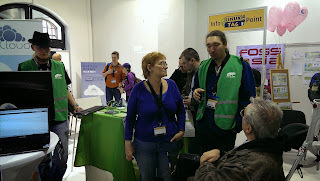 He already knew about ownCloud and took over, while I talked to a third visitor, answering some questions. Then a fourth showed up, who begun answering their questions while I turned to a fifth, explaining ownCloud... Great to get in conversations like that! During a quiet moment, a visitor came to me, complaining he had been 'in line' to talk to me several times, but it was so busy, he didn't get a chance before! Indeed, we had busy times, especially Thursday. But that's awesome, right? All in all, for me, it was a great event. During the booth work, we had the workshops going on. 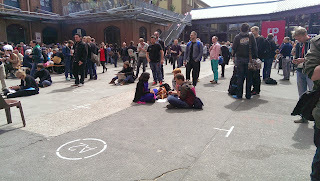 It had a bit of a slow start on Thursday morning, but quickly, the workshops started to attract some more people. 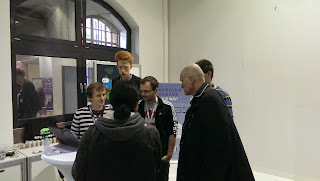 At one point did I see Sebastian surrounded by six visitors interested in KDE development... I think, on average, the workshops attracted about 3-6 visitors each. Which is quite good, considering they were primarily aimed at introducing people to contributing to our projects. Despite the amount of work preparing the booth workshops, I'd do it again. Imagine if only a third of the visitors decides to join the respective communities! 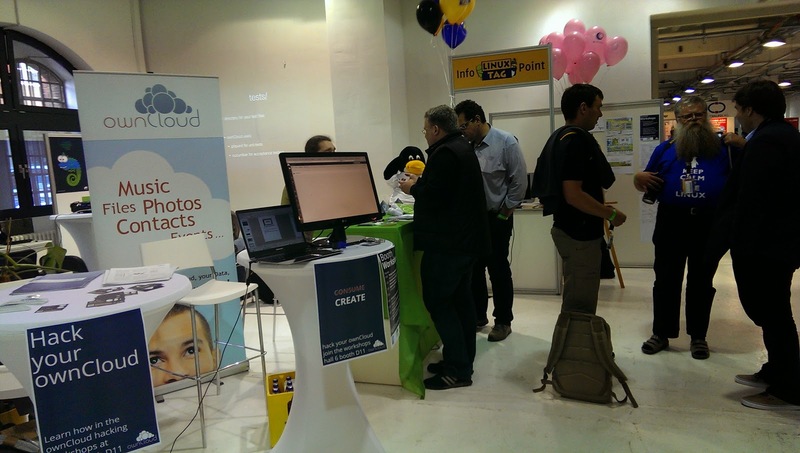 If you visited one of these booth workshops or our booth at LinuxTag, I'd love your feedback! Knowing how we did, if we were friendly, fun, interesting, or what was missing and what you'd like to see next time - it all helps us improve in the future! In any case, everybody who contributed to the booths and presentations as well as everybody who visited us: thank you very much! Of course very special hugs to the booth- and presentation team.